timone davis is a cradle Catholic who was a “pewster” until she discovered that the uselessness of the Church was because she wasn’t giving anything of herself. After committing to do something, her life changed. Her first ministry was with the RCIA, where she not only welcomed others into the Church, but also revitalized her own spirituality. … I am on a journey towards peace, speaking truth that opens people up to God. After working for the Archdiocese of Chicago as the coordinator of ReCiL – Reclaiming Christ in Life Young Adult Ministry, timone launched PEACE centered WHOLENESS with her husband Orlando, where they are blending clinical counseling and spiritual companioning. 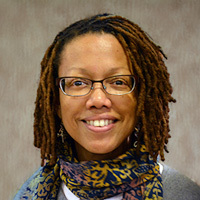 In addition to running a business, timone is a clinical assistant professor at the Institute of Pastoral Ministry at Loyola University Chicago. In her spare time, she serves as the treasurer of the Black Catholic Theological Symposium. timone’s dynamic energy and deep spirituality enhance her brand of teaching that engages one’s spirit through the use of storytelling. No matter the occasion, timone’s mission is to help others open their hearts and minds to the soul-saving power of God’s Grace, Love and Mercy.